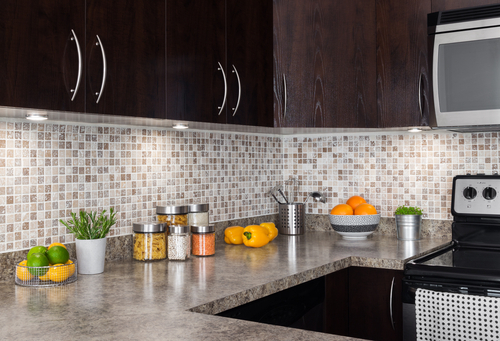 As most homeowners know, the kitchen is often the busiest and most used part of the house. As the most central part of the house, our kitchens have become the one room that usually tends to gather the most clutter with a slew of tempting new gadgets and unnecessary items that seemed necessary at the time. Let’s face it, we can’t resist kitchen sales during a shopping trip! Before you know it, there are countless pots and pans stacked on top of each other, mismatched Tupperware spilling out of the cabinets and endless amounts of pantry items that have gathered dust. Luckily, for those of you who have experienced this domestic nightmare, there are plenty of easy DIY projects out there to help organize your kitchen. Also, rather than keeping your main cooking utensils in a container on the counter or in drawers, The Created Home came up with the amazing idea of hanging mason jars by curtain hooks on any wall space you may have in your kitchen. While The Created Home uses the mason jars for flowers, we certainly think basic utensils such as spatulas and wooden spoons would have a perfect home here. Well organized pantries make the cooking process less frustrating, mainly because the necessary products are so much easier to find. Now we all know that pantries can become a huge mess simply because, with so much space, canned goods usually get pushed back and we lose track of what we actually have in stock. 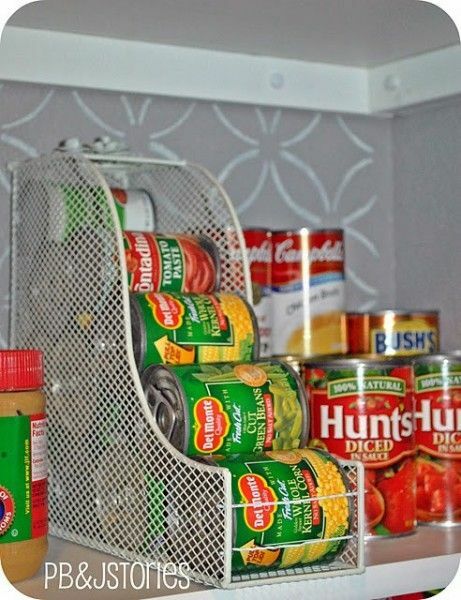 An easy way to combat this is to use a wire magazine rack to stack cans. 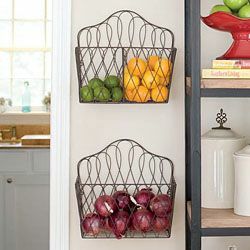 This also gives your pantry a more organized and polished look. Another great and inexpensive pantry idea is to purchase a door hanging jewelry organizer to store goods such as packaged seasonings, protein bars and snacks. 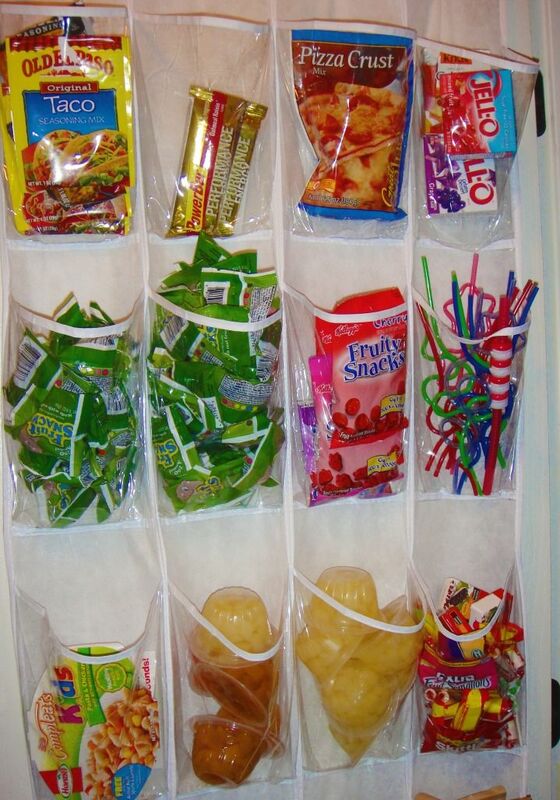 Be sure to store the snacks in the lower pouches to ensure easy access for the kiddos! Kitchen organization is made simple by these few steps. It can be a daunting process so be sure to give yourself some time and don’t try to tackle it all in the same day. 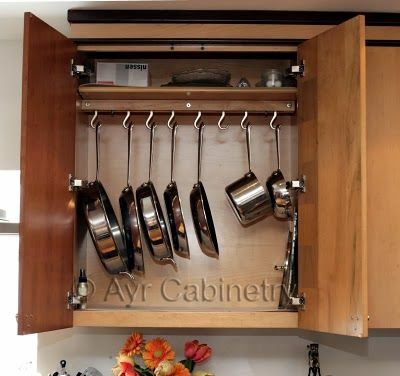 Here’s to the end of cabinets brimming with kitchen tools and the back aches you’re sure to acquire while digging through stacks of pans- happy organizing!